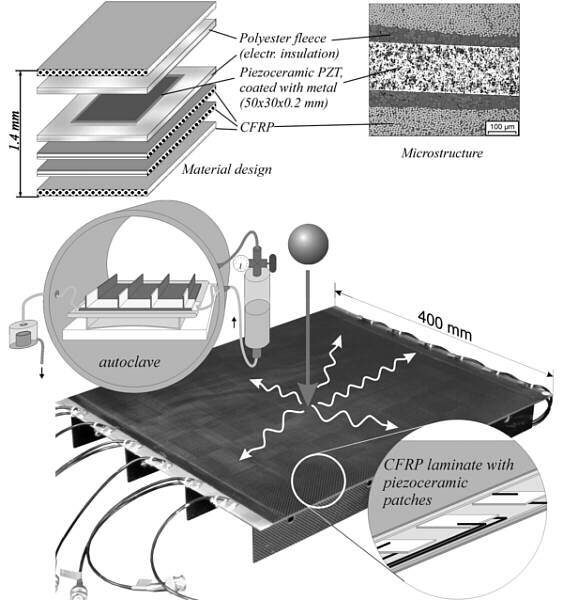 Smart materials based on carbon fibre-reinforced plastics with integrated piezoceramic sensors and actuators are expected to be a favorite composite for vibration damping and noise reduction . Figure 1 presents the material system and a stringer plate for fundamental investigations. Significant differences between mechanical and thermal properties of the ceramic patches and the matrix demand sophisticated manufacturing techniques. Various damage mechanisms may reduce or even destroy the sensing and actuating capabilities of the piezoceramic material. To improve the performance and to predict the reliable life-time of adaptive structures it is necessary to analyse and describe quantitatively the damage process as a complex microscale interaction between the embedded patches and the host structure. The major challenge is to create a suitable damage tolerance concept integrating a damage mechanics methodology combined with advanced non-destructive diagnostics . In extension to conventional non-destructive evaluation (NDE) after manufacturing and during inspection breaks, a smart material can be used in a self diagnostic manner to detect early damage stages. This approach results in more intelligent NDE procedures. Its successful application requires fundamental knowledge of nature, size and location of damage as well as extensive data acquisition and processing . The real-time health monitoring techniques should provide reduced maintenance costs and offer many unique opportunities to assess the structural integrity . The scope of properties to be evaluated includes the internal structure of the composite (fiber orientation, ply sequence, sensor and actuator position, local fiber or epoxy concentrations), planar flaws oriented parallel to the surface (delamination, ceramic debonding), perpendicular oriented flaws (cracks of the matrix or of the patches) and volume imperfections (pores, voids, inclusions). Some typical imperfections in the smart material system are shown in Figure 2. In research and development, NDE helps to find out suitable components and to optimize the manufacturing process. During and after manufacturing NDE brings up the structural state of the composite and visualizes imperfections. Additionally, NDE accompanies mechanical testing. Non-destructive in-service inspection of the material system can be accomplished during inspection breaks. Current work is focused to the development of methods using the active capabilities of the embedded actuators and sensors for NDE purposes. Furthermore, continuous methods with external as well as internal approaches are created. Fig. 3 presents these stages from the signal generating point of view. At the first stage, a transmitting and receiving probe scans the object. The object may be either passive or active. At the second stage, the internal actuators are used as transmitters for the test signal. 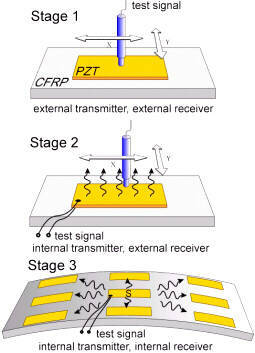 An external scanning sensor (or sensor array) receives the signal characterizing the transmitter (actuator) as well as the channel (structure). Of course, this principle may be inverted. Both stages create images as the inspection result. Finally, the third stage is aimed to avoid any external sensor or transmitter. Here, the internal sensors and actuators perform as transmitters and receivers. To get information about local distribution of structural properties the transmitting function may be switched to various actuators. Unfortunately, no images can be expected and it is a matter of further investigations to find out the chances and limitations of this approach. Results of the stages 2 and 3 are outlined in paper 250 of the present proceedings . 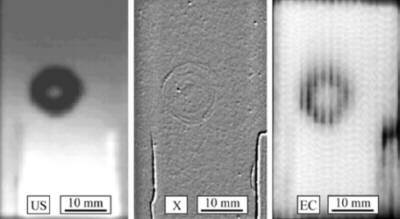 Specimens (46x11x2 mm3) with a structure according to Figure 1 but with two symmetrically embedded piezoceramic patches on each side were loaded in three-point bending tests for microscopic and in-situ Scanning Electron Microscope (SEM) examination. The primary goal was to identify initial damage by acoustic emission (AE) and SEM images. A load-displacement curve and the cumulative energy of acoustic emission can be seen in Figure 4.
d) crack propagation in the compression stressed piezoceramic patch. Comparing the results of specimens containing piezoceramic patches with specimens without any ceramics, the AE method seems to be well suited to monitor the early damage development in the piezoceramic patch. The essential idea is to use the anisotropic conductivity of the material. Along the carbon fibers much better conductivity is found than across the fibers. Additionally, the piezoceramic patches are coated with thin copper-nickel layers providing electrical contacting. This layer is able to carry eddy current. In case of patch cracking the coating also cracks thus interrupting current paths [6,9]. Ultrasonic testing is based on the reflection and transmission behavior of elastomechanic waves at internal structures and so different reflection and transmission testing techniques are applicable . The perpendicular incidence of longitudinal waves corresponds to the existence of pure longitudinal wave mode and admits the detection of most structural flaws. For testing of smart CFRP structures, the problems of the materials anisotropy, heterogeneity and layered structure have to be kept in mind [8,9]. X-radiation is suitable to study both surface and internal damage of the laminate as well as of the piezoceramic. Digital X-ray imaging using a special differential technique was used to detect cracks in the piezoceramic. 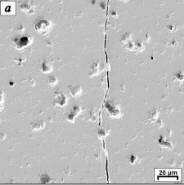 Structural inhomogeneities can cause cracks in the piezoceramic patch. Figure 6 presents an example of a DP-RTM (differential pressure resin transfer moulding ) specimen. The US C-scan 6a) shows a nearly circular dark area resulting from deteriorated reflection conditions. The EC scan visualizes a branched out crack covering this area. After preparing a microsection, the reason for the dark area in the US-scan could be found. The structure of the insulation fleece is changing significantly below the piezoceramic patch. The fine-fibrous structure on the right side is coarsing to the left side even forming conglomerates. Local and temporal differences in the composition of the epoxy in the insulation layer and during curing have caused these structural imperfections. The resulting inhomogeneous pressure distribution at autoclave treatment has lead to local bending forces subsequently causing the crack. 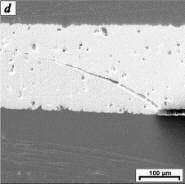 Fig 6: Ceramic cracking caused by structural inhomogeneities. A very sensitive point is the contacting of actuators because it also may damage them during autoclave curing . One kind of contacting are dedicated windows in the insulation fleece as shown in figure 7. 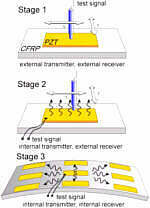 The conducting CFRP layer acts as the common electrode for some actuators. The contact window causes an actuator deformation at curing. The resulting stresses deform the actuator and even may induce cracks. US-C-scan indicates this deformed area due to reduced time of flight of longitudinal waves. The degree of deformation can be measured in the US-B-scan with an accuracy up to 20 µm. Additionally, US-C-scan shows some branches of a crack and the contacting carbon fiber roving. EC image clearly makes visible the cracks and indicates the deformation as dark area due to the reduced distance between the actuator and the probe. X-ray image brings up the cracks but cannot detect the deformation. Fig. 8 presents results of a multi-actuator specimen with some patches remaining passive at function test. The reason were unidentified short-circuits and breakdowns causing local material degradation. The US-scan in figure 8a) of one of the ceramic patches (grey rectangle) brings up a bright circular area caused by the bending of the patch into the contacting window. The dark spots at the right and left edge of the piezoceramic patch are the points of short-ciruits between the current carrying rovings and the metallic coating of the piezoceramic patch. A US C-scan of another depth plane in figure 9b) shows bright lines starting at these points. Due to their reflection properties they could be identified as carbon fibre rovings unintentionally brought into the material. The EC scan in figure 8c) brings up the edges of the piezoceramic patch as well as the contact roving on the front side of the patch. Additionally, linear objects can be recognised corresponding to the US result. 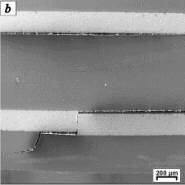 These anomalies of conductivity confirm the assumption of spliced carbon fibres close to the piezoceramic patch. Plastographic investigations confirmed this result, which gave explanation of the short-circuits. Impact damage can be visualized by various NDE methods giving a comprehensive survey of the complicated structure of this damage. Every method brings up other details. The first example in figure 9 shows EC, US and X-ray images of a low speed impact damage caused by a drop weight impactor with an energy of 5 Joule. A wide delamination between 0° and 90° CFRP layers is indicated. EC and US images correspond very well at this type of damage. The reason for eddy current indication is the interrupt of interlayer circular currents . The X-ray image brings up two large straight cracks and a circular cracked area in the PZT confirming the EC image. The second example in figure 10 presents NDE images of a low speed impact of only 0.5 Joule caused by drop weight on a DP-RTM specimen. No damage can be recognized visually. In the lower part of the piezoceramic patch, the NDE images bring up cracks caused by two contacting rovings from both sides of the patch during autoclave curing. The circular area results from the impact. The US scan in fig. 10a) was recorded using active US method reported in paper 250 of the present proceedings. Here, the piezoceramic patch acts as the US transmitter and the scanning transducer only receives the acoustic waves. One advantage of this method is the suppression of covering CFRP layers. This special technique shows that the piezoceramic in the inner and outer areas of the ring remains active. The absence of the signal in the ring area is caused by delaminations, interrupting the transmission of the acoustic waves to the scanning transducer. The X-ray in figure 10b) brings up circular cracks in the piezoceramic patch. In the EC scan of figure 10c) also a dark ring can be seen resulting from the damaged metal coating of the patch. All NDE images confirm the fact that no significant damage has occurred in the centre of the damaged zone. Recent advances in smart materials offer many unique opportunities of adaptive structures technology. However, to improve the manufacturing process and the reliability of such structures a comprehensive non-destructive characterization is necessary. High resolution techniques are able to visualize manufacturing imperfections as well as defects induced by operational conditions. The wide variety of physical properties of CFRP and piezoceramics demands a combination of different NDE methods. Together with mechanical methods, eddy current, ultrasonic and X-ray methods help to improve the adaptive material system. 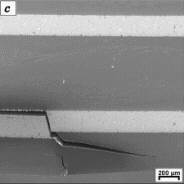 Experimental investigations indicate that microcracking of the embedded piezoceramic patches and delaminations at interfaces govern the degradation of this class of materials. Based on these results, the future development is aimed onto direct application of the embedded active elements for health monitoring of adaptive structures. The present work is part of the research project "Adaptive mechanische Systeme - ADAMES" of the Otto-von-Guericke-Universitaet Magdeburg, sponsored by the Deutsche Forschungsgemeinschaft (DFG). The support is gratefully acknowledged. Furthermore, we would like to thank P. Veit, G. Dehne and A. Hilbig for their assistance. Hanselka, H.: Realization of Smart Structures by Using Fiber Composite Materials, In: Gabbert, U. (Ed. ): Smart Mechanical Systems - Adaptronics, VDI Fortschritt Berichte, Reihe 11, Nr. 244, VDI-Verlag, Duesseldorf, 1997, pp. 1-10. Blumenauer, H.; Dehne, G.; Michel, F.; Mook, G.; Pohl, J.: Non-destructive damage evaluation of adaptive materials. In: Int. J. of Materials and Product Technology (Geneva) 14 (1999), Nr. 2/3/4, pp. 291-303, ISBN 0268-1900. Ayres, J.A. ; Lalande, F.; Chaudhry, Z.; Rogers, C.A. : Qualitative impedance-based health monitoring of civil infrastructures, Smart Mat. Struct., Vol. 7, 1998, pp. 599-605. Pines, D.; Lovell, P.A. : Conceptual framework of a remote wireless health monitoring system for large civil structures, Smart Mat. Struct., Vol. 7, 1998, pp. 627-636. Pohl, J.; Mook, G.; Michel, F.: Health Monitoring of Smart CFRP Structures. 15th WCNDT, Rome, October 2000, paper ID 250. Lange, R.; Mook, G.: Structural Analysis of CFRP Using Eddy Current Methods, NDT&E international, Vol. 27, 1994, No. 5, pp. 241-248. 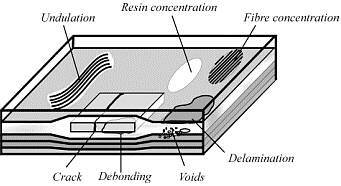 Bar-Cohen, Y.: NDE of fiber reinforced composites - a review, Mat. Eval., Vol. 44, 1986, No. 4, pp. 446-454. Pohl, J.: Ultrasonic Inspection of Adaptive CFRP Structures, 7th European Conference on Non-Destructive Testing, Copenhagen, May 26-29, 1998, pp. 111-118. Mook, G.; Pohl, J.; Michel, F.; Benziger, T.; Hilbig, A.: Non-Destructive Imaging Techniques for Damage Evaluation of Smart Materials. In: P.-J.. Winkler (ed. ): Materials for Transportation Technology. Euromat 99-Volume 1, Wiley-VCH Weinheim, 2000, pp.198-203.